One of the wonderful things about living in the Steamboat Peninsula area is the beautiful natural surroundings. Traveling to and from our homes we are treated to vistas of forests, fields, prairies, wetlands, inlets and shorelines. As we spend time in these surroundings, we become familiar with the wildlife with which we share these special places: eagles, herons, pileated woodpeckers, song birds, raccoons, frogs, salamanders, snakes, salmon and shellfish to name a few! For many of us the wildlife and the natural landscape are what make living here a special and rewarding experience. But as the region’s human population grows, will these special places and experiences be here for future generations? Will the salmon and shellfish that have sustained the region’s people and economy for centuries remain healthy? Will the Steamboat Peninsula retain its unique character? To meet this challenge, Capitol Land Trust and the Griffin Neighborhood Association have formed the Steamboat Conservation Partnership. Supported by local landowners, families and businesses, the Steamboat Conservation Partnership will conserve the special natural areas that make the Eld and Totten Inlet watersheds so unique. Recently protected areas in our region include the Adams Cove pocket estuary on Totten Inlet, undeveloped shoreline property on Eld Inlet near Hunter Point, and the Lower Eld Inlet Preserve on Mud Bay south of Highway 101. We have recently added 530 acres along the upper Schneider Creek Valley to lands conserved by the Wynne family. Together with the Steamboat Conservation Partnership, Capitol Land Trust is working to conserve more critical areas in our region. Since this collaboration took effect, we have been able to protect more than 300 acres in the Steamboat Peninsula region. The mission of the Steamboat Conservation Partnership is “to conserve the rich and diverse natural landscapes of the Steamboat Peninsula region.” Capitol Land Trust and the Association agree that this natural environment provides important quality of life benefits to area residents and is essential for sustaining robust populations of native fish and wildlife. The Steamboat Peninsula region is defined as the Steamboat Peninsula in northwest Thurston County, as well as all other areas within the Eld Inlet and Totten Inlet watersheds, including the areas within the Kennedy, Schneider, Perry, and McLane creek watersheds. The priority area for focus of outreach is the portion of the region within the Griffin School District. Capitol Land Trust shall engage in activities designed to conserve special natural areas in the Steamboat Peninsula region and that maintain connections between these lands through corridors useful for wildlife movement. Examples of special natural areas include marine shorelines, estuaries (including pocket estuaries), freshwater streams and riparian habitat, prairies, wetlands, and upland forests. Capitol Land Trust will consult with the Association on a periodic basis to: obtain input on strategy and priorities, keep the Association informed about their progress, obtain assistance and notify neighbors about volunteer opportunities. As opportunities are identified, the Association and Land Trust will work together to develop an implementation strategy and obtain funding to implement conservation projects. 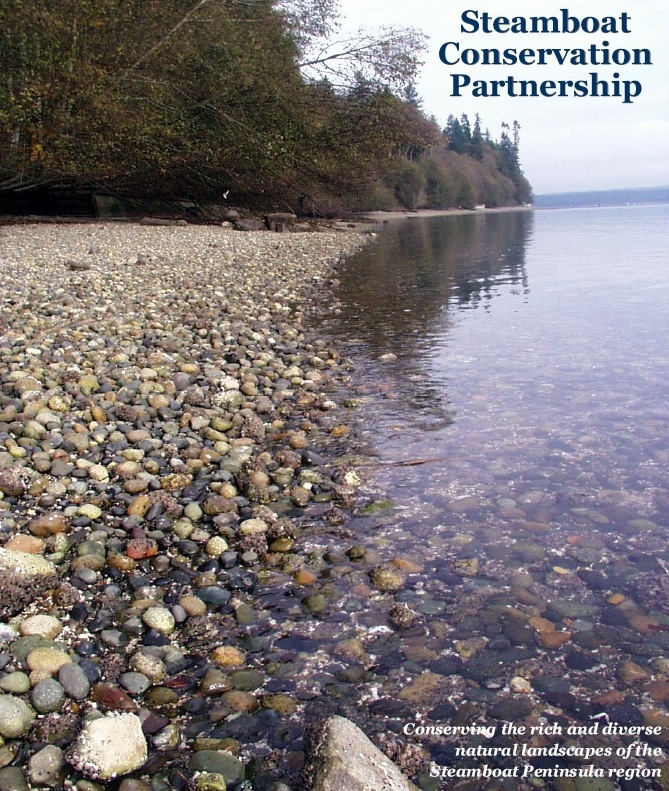 Capitol Land Trust has created the Steamboat Conservation Partnership Trust Account as a segregated account dedicated to finance conservation activities within the Steamboat Peninsula region. The Land Trust is a Washington nonprofit 501(c)(3) corporation and contributions to the Trust Account are tax deductible for Federal income tax purposes. Commencing in 2009, the Association has solicited contributions for the Steamboat Conservation Partnership Trust Account with the aim of procuring at least fifteen thousand dollars ($15,000) per year for five years. To date, we have consistently met our fundraising goals. In 2014, the Association and Capitol Land Trust agreed to renew our partnership for another five years. With your help, we will continue to meet our funding commitment for this next five year term. Won't you help? On the next page, please enter "SCP" or "Steamboat Partnership"
ensure your contribution is put to work for the Partnership. Capitol Land Trust is a 501(c)3 nonprofit organization and your contributions are tax-deductible to the full extent of the law. Your contribution will sustain staffing and professional resources needed to identify, acquire and manage strategic sites within the Steamboat Peninsula region. Join the Steamboat Conservation Partnership by contributing at least $300 each year for five years (premium, Bald Eagle level) or $150 each year for five years (Blue Heron level). Click here to download our enrollment form. Protect and restore natural habitat on your land. There are many ways to conserve your land. Click here for more information. Become a member of Capitol Land Trust and the Griffin Neighborhood Association. Click here to download our informational flyer. There's more! Click here to read all our blog articles regarding the Steamboat Conservation Partnership. Thank you for your interest. National Geographic provides free downloads of 7.5 minute topographical maps. Our area is encompassed within five separate map packages. 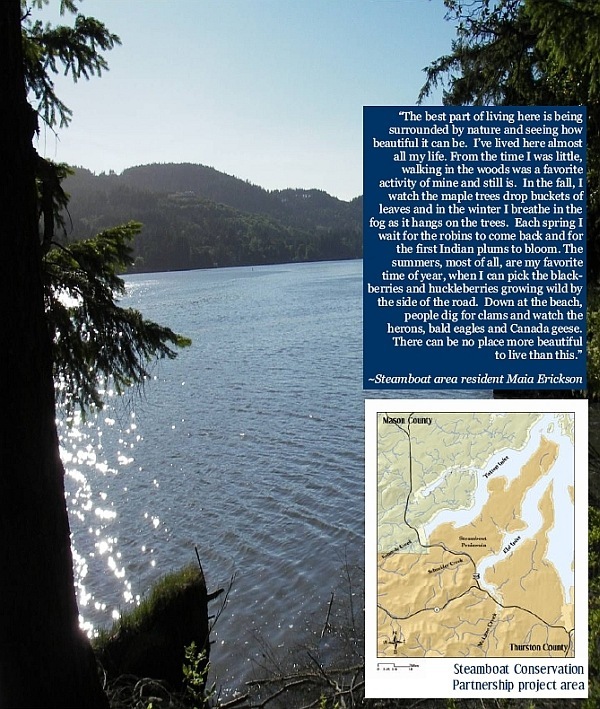 Each map package is five pages in length and can be easily printed from a home printer. Page 1 is an overview map showing the topo in context. Pages 2 through 5 are the standard USGS topo cut in quarters to fit on standard printers. Click here to find your map and download it directly from the National Geographic's web site. Or, download from this page any or all of the five map packages that cover our area. The northern tip of Steamboat Peninsula (the upper right red marker) is the Squaxin Island grid. 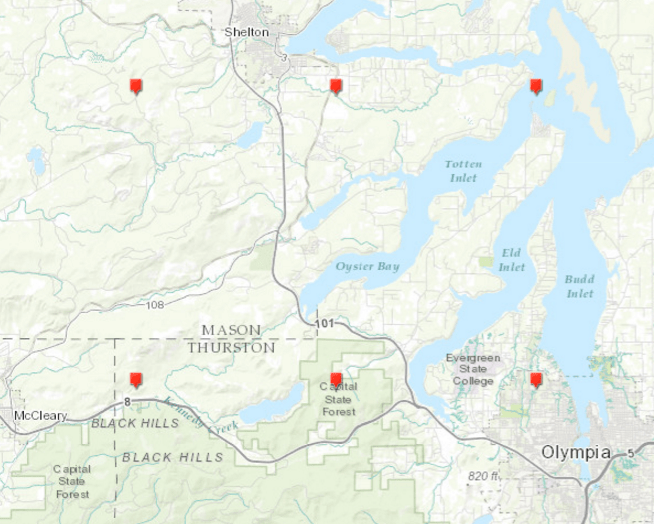 The area around Flapjack Point, on Eld Inlet, is the Tumwater grid. This is the lower right red marker, on the image above. The southern end of Steamboat Peninsula is within the Summit Lake grid. West of Summit Lake is within the Kamilche Valley grid. A sliver of Steamboat Peninsula, near Hudson Cove and Cougar Point on Totten Inlet, is within the Shelton grid.